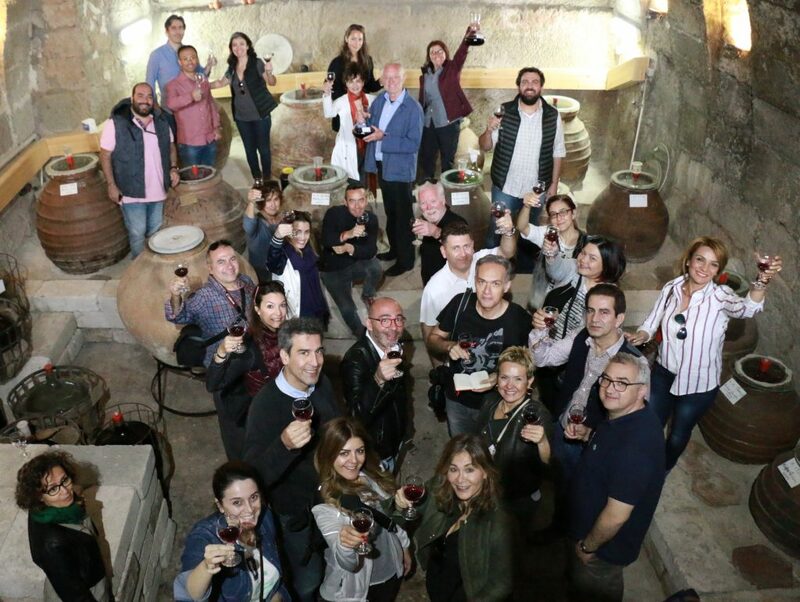 Güzelyurt is situated about 1500m high and so are the vineyards of the area which belong to the highest-altitude winegrowing regions in the world. Harvest and processing of the grapes usually does not start before early October. At this time temperatures during the day are just over 20°C but can lower to 9°C in the night. We made our wines in steel tanks and in free-standing küps for the first two years. 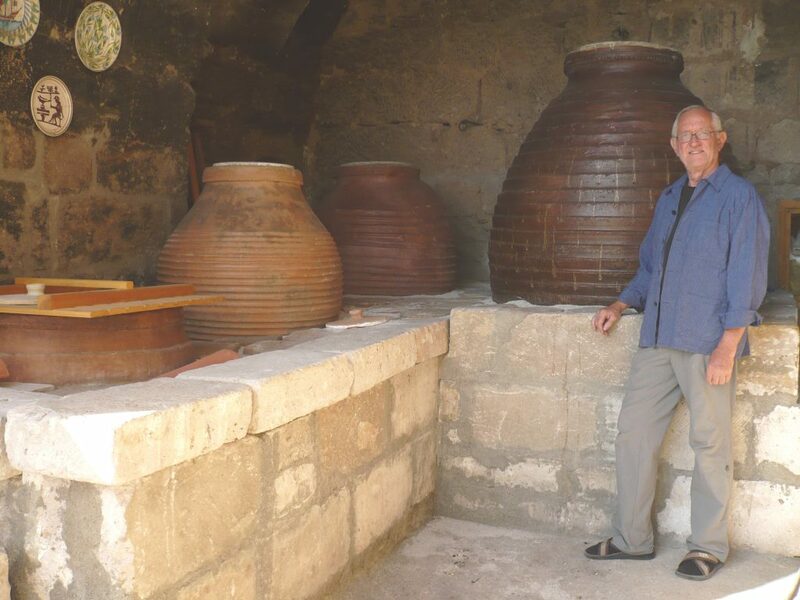 Since 2011 we have been using küps (amphorae) only. Red as well as white grapes are crushed and de-stemmed in a mill. 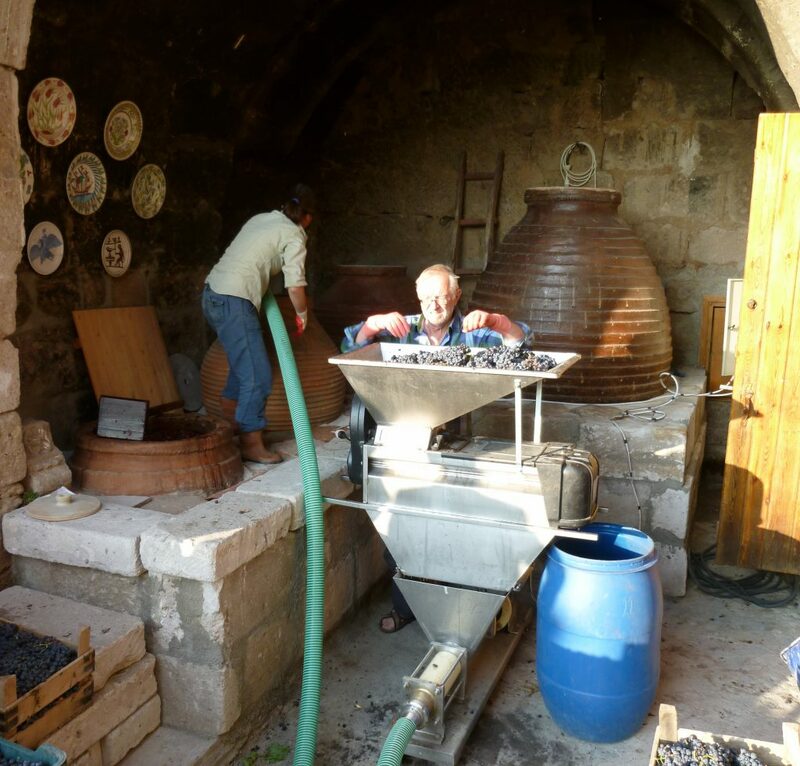 Without pressing the crushed grapes we immediately transfer them from the mill into the küp. Depending on the type of grape, we put some part of the stems back to the must two or three days later. 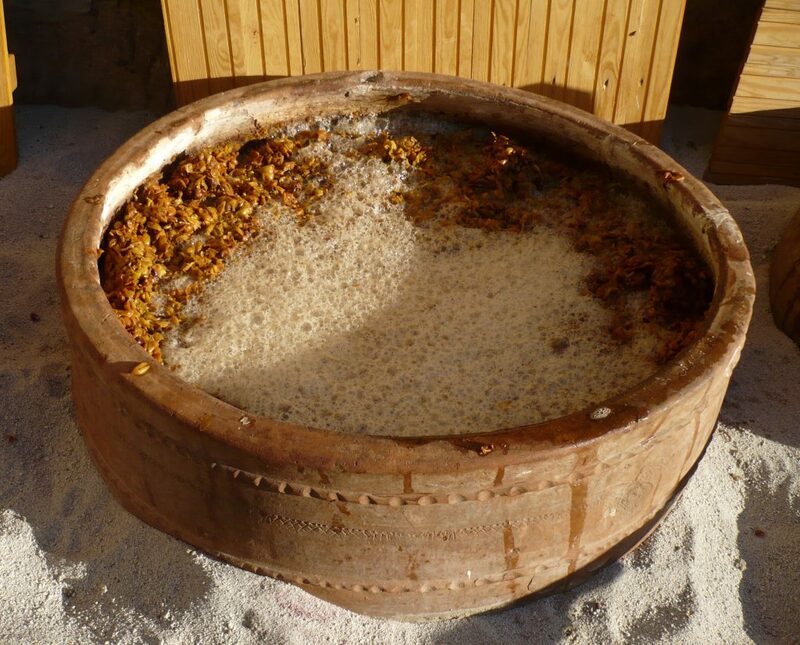 Fermentation of the must in the open küp starts rather spontaneously after eight to twenty-four hours. If the must cap is not stirred regularly and carefully, the liquid spills out all over the küp. 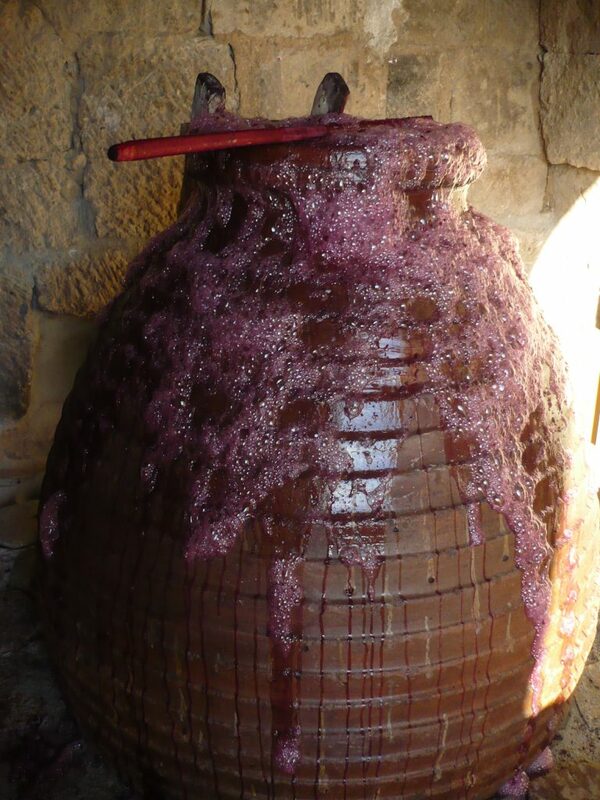 Fermentation is normally finished between ten to twenty days later, but it might take much longer before the sugar has completely been transformed to alcohol and a dry wine has developed. After having experimented for some time we now leave part of the skins or even the total amount, seeds and stems together with the wine in the küp for four to eight months. 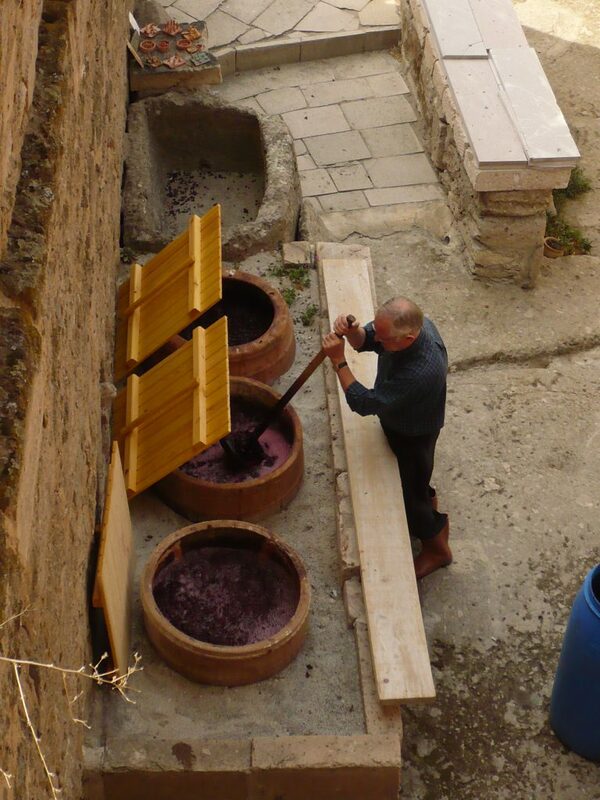 It depends on the grape variety how much of the grape residues we leave with the wine. Within the first two days of fermentation we decide how much of the stem residue we are going to add, which depends on taste. When fermentation is finished we fill the küp up and close it tightly. 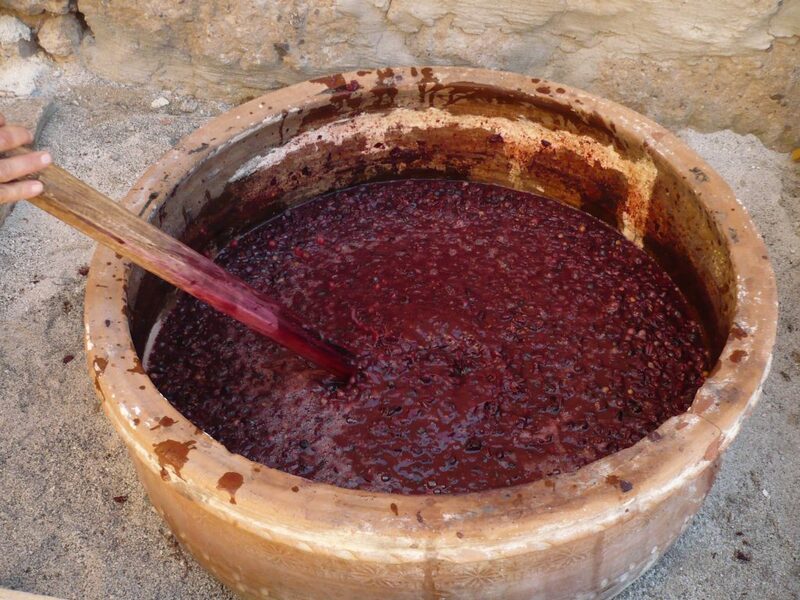 During the following months grape skins, stems, seeds and sediment slowly settle on the bottom of the küp and the wine clarifies and stabilizes on its own account. We organize our “Dionysos Symposium” in early April. It is the special event when we open the küps for the first time to taste our young wines. We then also decide how to proceed further: separating grape skins, stems, seeds and sediment from the wine; bottling or transferring the clarified wine into other küps for further maturation. Our white wine develops in the cellar where the temperature remains constant whereas the red wine develops in a half open area where it is constantly exposed to varying day- and night-temperatures. We never use any chemical additives or other substances, neither for growing our vines nor for making the wine. 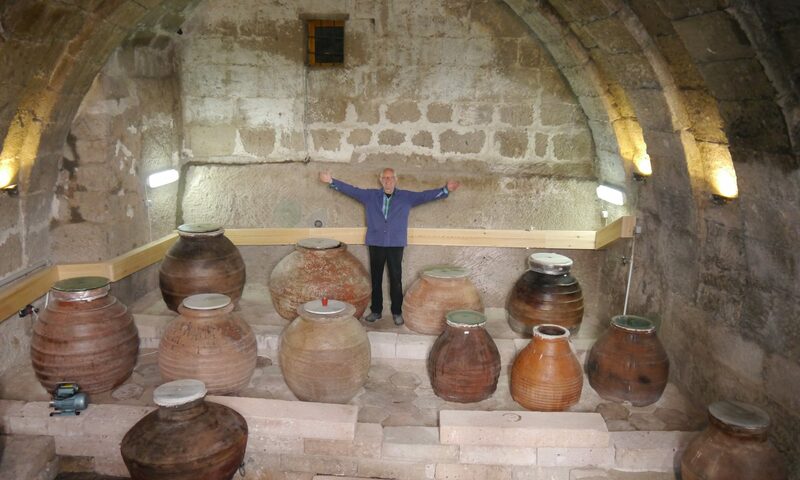 We do not need to fine or filter our wines because they clarify by themselves.